Posted November 30th, 2017 by Rachel Hammond & filed under christmas. 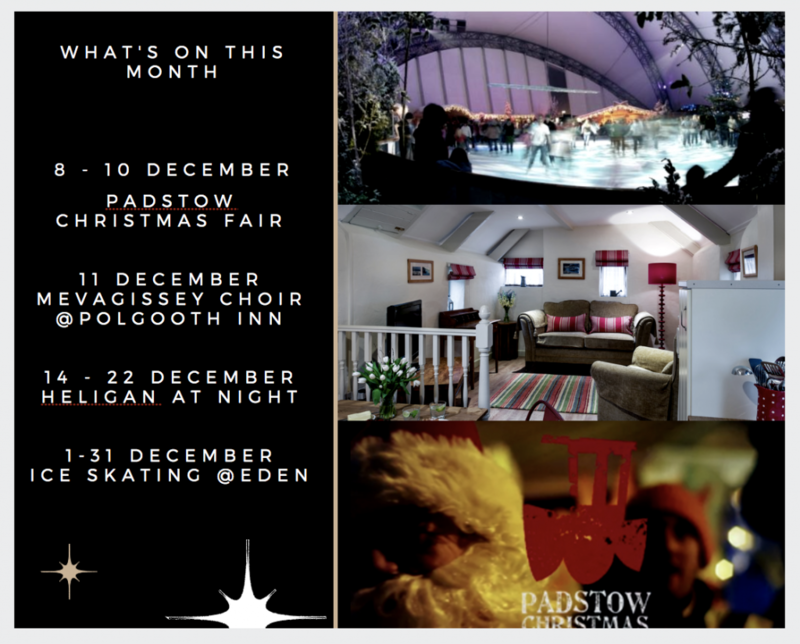 ‘What can we do in Cornwall in December?’ you might say! Well, there is plenty to do in Cornwall at any time of the year. If you’re lucky enough to be visiting Cornwall in the run-up to Christmas, there is plenty to celebrate. All around the county we have lively Christmas markets and a variety of pop-up foodie and craft events. Local artists and makers throw open their studios. It’s a great time of year to see our county ‘behind the scenes’. From Bude to Newlyn you’ll find Cornish towns and villages lit up with spectacular light displays. We’ll preview the best Christmas lights of 2017 in another blog – but here’s a list of our favourite calendar events so you don’t miss out if you’re visiting. From ice-skating to carols, with a sprinkling of good food and our favourite Heligan Gardens by night time in between, we think you’ll find something you love. We don’t think you can beat coming home and curling up on a comfy sofa with a cosy hot chocolate. And of course if you’re staying in one of our cosy cottages, it’s your home away from home. Whatever you’ve been doing all day, there is no better way to relax! For a good list of what’s on in Cornwall throughout the year, we like to keep an eye on Visit Truro and Visit Cornwall.